We will work with your SCHOOL or SPORTS CLUB to create an inviting colourful synthetic grass sports surface that will better utilise your existing asphalt, concrete court or natural grass oval area. A refurbishment or replacement of your outdoor sports area or playground surface with a multi-purpose artificial turf sports surface may be the perfect solution for your school or sports club. Your project will be managed and constructed by an honest and reliable licensed builder with 36 years’ knowledge and experience gained from working in the Building and Construction Industry in Tasmania. 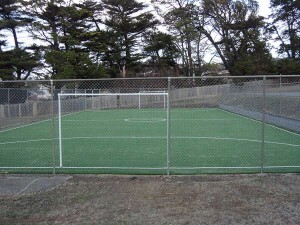 SGT Sports Surfaces, (Synthetic Grass Tasmania), has 14 years’ experience installing synthetic grass sport surfaces throughout the greater Hobart area and Tasmania. You will receive advice and assistance with matching your sports surface to the correct artificial turf product. Base works and materials will be constructed to Industry Standards, with sand and/or rubber infill to technical specifications (no shortcuts taken). By working with you throughout your project you can be confident of an aesthetically pleasing sports surface installation for your School PE or Sporting CLUB activities. You can create an environment with a more professional facility to encourage children to have fun, participate, and be physically and socially active. 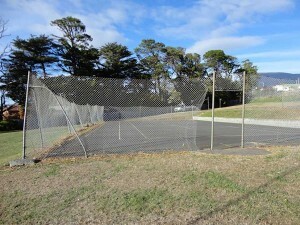 View the BEFORE and AFTER images below, as well as the MULTI SPORT SURFACES information page and gallery.